Radio Dubroom is a series of podcasts, started in May 2010. The music contains not just the best of the Online (DUB) Reggae Artists community, but also material which is reviewed in the Dubroom, rare or out-of-print music, and much more. Every episode is a non-stop mix, available for free download right from the Dubroom server. Just click "Download" and you will be redirected in a new window to the right download page. 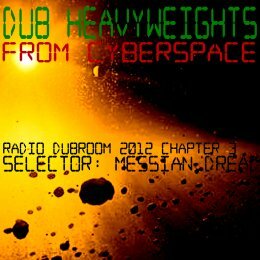 WWW, August 2012 - With the exception of the first track in this chapter of Radio Dubroom 2012, every single title can be downloaded for free and legal from mp3.dubroom.org and -again- with the exception of the first selection, this is a show filled with heavy steppin' DUBS and a few vocals. This is some of the hardest contemporary DUB from all over the globe fe true! As said, the opening track is the only exception when it comes to availability and drum rhythm. It's definitely not an exception to the High Quality material presented in this non-stop mix. Singer Izyah Davis, whom we'll meet again later in the show opens up with a touching DUB from UK based Producer and Drummer Fullness. Next up are two vocals and one DUB by the French vocal duo Fu Steps, really an impressive vocal talent and skill is represented in the music. The tracks are recently reviewed in the Dubroom, by the way, just like the hard stepping DUBS that are about to follow: Kanka, Digitaldubs with -again- Izyah Davis, and Gary Clunk. DUB Soldier's "Riots Inna Babylon", which was played once in an earlier chapter of Radio Dubroom, and the Natural Warriors' "Dubwise Attak" are downloaded from the great DUB resource and social website called Talawa. When you want the tracks, you'll have to register but that would only open you up to some very interesting material when it comes to DUB and ROOTS. A few steppers with a less electronic sounding instrumentation is there too, in the form of Jahno's "Geddion Style" and PAMA, the UK based band that most surprisingly signed up with a label that never signs artists: Trojan. One of the two DUBS is even mixed by none other than the Mad Professor! R.E. Sistance In DUB and BR Styler's "Hemp DUB" are both taken from Alambic Conspiracy's "Missing Dub Versions", a free album reviewed in the Dubroom. The heavyweight Alpha & Omega stepper from Disciple's Roaring Lion riddim with singer Dan-I is another beauty from the Talawa website, where you can also find producers themselves uploading a tune here and there. Massive DUB Corporation and Don Fe are there too, each one with a hard hitting Steppers DUB and each one mixed in their own style. Dubalizer's "Soldier of DUB", which was played before on Radio Dubroom is another gem from Cyberspace just like the last two tracks: first the DUB, and the the vocal called "Keep an Eye" mixed by Gary Clunk and beautifully sung by Sis Bethsabee. Another hard hitting selection fe real! All tracks in this podcast (C) by artists and labels. This podcast (C) by Dubroom. Feel free to link to the chapter(s) on your website, blog or forum post but please do not put a direct download link to the podcast MP3 but rather to this page or radio.dubroom.org in general. Labels, artists and/or producers. CONTACT the Dubroom if you want to be promoted through Radio Dubroom.